So last week, our sister company, Sevenvault, turns 2! As some of you may have already learn from here, they started an online initiative, #Sevenvault2give on social media to help make our society a better place. While this is still an on-going social movement, we are very pleased to say that many people have took part in this movement, local influencers included! These influencers set out to use their influence to encourage their followers to join them in working to make Malaysia a better place for everyone. So, how many of these gestures do you apply in your daily life? Everybody (especially Malaysians) love food and most people would never say no to free food! Growing up in an Asian culture, we were all taught that sharing is caring. So, in this context, treating someone a meal is a gesture that says “because you matter”. It can be for anyone; you may treat your friend a meal, or even getting a packet of nasi lemak bungkus for that uncle who collect your recycle items regularly. The act of gifting itself is simply one of the greatest thing that you can do for those around you. Try them. it’s good for your soul (and friendship)! So, when was the last time you treated someone to a meal? Why not start today and see how what goes around comes around? We live in a time where the Internet provides us with all kinds of information. From up-to-date news to information about our friends to cute cat videos, the Internet has it all. However, with free access to an abundance of information lies information that are inaccurate. Which is why it is important for us to always verify your information before sharing it online, or offline. We don’t want to spam our Whatsapp group chats with news about how a riot just broke out in town, or how cat poop that cured cancer before actually verifying them, do we? This is another simple act that could be carried out to ensure that our community consumes only verified information so that the peace and stability of our nation can be contained from the inside. We never know what someone is going through on a particular day, so why not encourage someone each day? A simple word of encouragement is more than just words and can make an impact on someone when we least expect it. Why not make it a habit to use our words to build, not break? It doesn’t matter who we reach out to, as long as we make the effort to brighten someone’s day. The results of this simple act could be very far reaching and could impact more people than we realize. Whether it is an elevator door, a car door, or a regular door in public or at home; holding the door open for someone is a very simple gesture that goes a long way. In public, it can really make someone’s day or help them when they are struggling. It could even be a good starting point for a pleasant conversation. Back at home, it can be a great way to let your loved ones know that you care about them and think of them, even when they may not be expecting it. Tiny gestures as such takes almost no effort at all to make a person’s day. There is no harm to lend an ear and a shoulder for some to lean on, especially for those who really need to talk to someone about their struggles. Having no one to turn to during the roughest days can break the spirit of even the toughest chap out there. We all need somebody to lean on. So if you’re having one of those days while you’re reading this, if you need a friend (email us) email us uh huh (email us). Double-parking is at best, an inconvenience and at worst, an annoyance. Though we understand that there are situations where we’re in a hurry and need to park nearby for some reasons. So if you ever find yourself in such a situation, it’s best to leave your contact number so whoever you end up blocking can let you know if they need to move. A small gesture like this can go a long way towards making our society more friendly and amicable. Let’s get into the habit of clearing our own trays after we eat our food. It might seem like extra work at first but before long, it can become second-nature to us. This simple act can make a huge impact on the lives of the staff at restaurants, and even customers like ourselves, if everyone does it. This is applicable especially when we are dining out at food courts, fast food joints (or IKEA) where cleaning service is not as prompt as we’d like it to be during peak hours. Perhaps it would ripple outwards and inspire our close ones to follow suit as well. A smile is a simple thing which has many benefits. It can brighten up someone’s day, it can lift up your own mood, and it can even make you seem more approachable. The positive impression given off by a genuine smile can be really heartwarming and affirming, even to a total stranger. Starting a movement to practice good values was only the start. On behalf of Sevenvault, we would like to thank everyone who took part in the movement, including all the influencers who used their social media platform for a greater cause. The movement doesn’t stop here! Why not continue to do little things like what we have just mentioned before? If more people get into the habit of doing them, even little things can make a big impact in making our country a better place. If you’re not convinced yet, let’s hear from the Founder of Sevenvault, Adele Chow, as she talks about the initiative that she and her team of Ninjas carried out last week! ITS OUR BIRTHDAY WEEK, SEVENVAULT IS FINALLY TURNING TWO! ?? Instead of throwing yet another birthday bash, we decided this year we want to GIVEBACK, so we started an online initiative – #SEVENVAULT2GIVE !! #Sevenvault2Give is an online movement starting with a heart to rally everyone to continue our love for our beautiful nation, Malaysia. We strongly believe “to love is to give”, hence we want to use our strength, the social media platform, to encourage you to share ONE good attribute that may make this country a better place! We believe in ONE voice! Let’s do our part for Malaysia! Join us in this effort! All you have to do is: 1. Take a picture of yourself holding a white paper/board 2. Share something you would like to do for someone eg: “hold the door for your neighbour”.. etc 3. Post it on your IG with the hashtag #SEVENVAULT2GIVE Tag someone you know that will be keen to be apart of this!!! ?? To add icing on the cake, here’s a few words from Sevenvault’s BD Director, Tzia who explains further about #Sevenvault2Give initiative. Take a picture of yourself holding a white paper or board. It’d be an added bonus if your Instagram profile is set on public mode so that we can drop a hola! 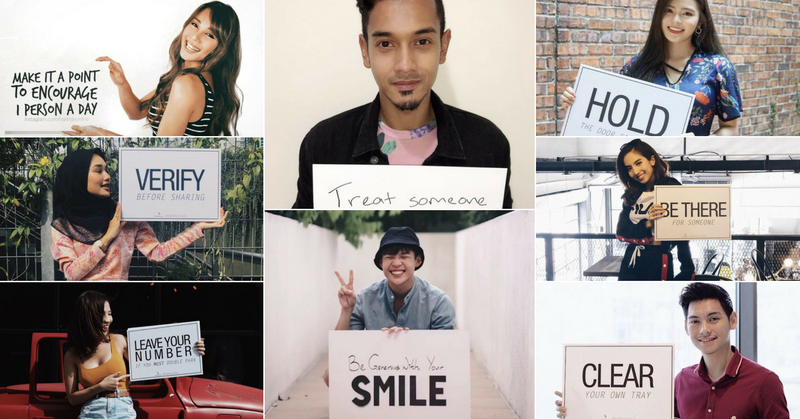 We can’t wait to see all your encouraging posts and help us make Malaysia a better place for everyone!